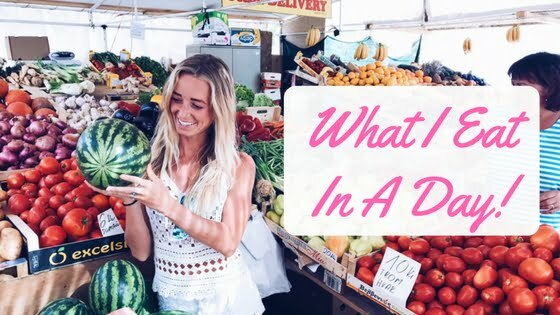 After an overwhelming number of requests for a blog post on What I Eat In A Day, it’s finally here! Now I want you to remember that this is what “I” eat in a day, so it doesn’t mean that it is appropriate for everyone. This way of eating suits me and my lifestyle. I’m very healthy, energetic, have a strong immune system & rarely get sick, all my pathology & physiological test results (e.g. bone density etc) are very good, so I know that this way of eating is beneficial for me. This blog is based on what I’m currently eating at the moment and is a general overview of what I would eat in a typical day. I’ve included the most common options that I would have at each meal but these do change. For example, I’ve listed my 2 most common breakfasts, however I may also have a bowl of wholegrain cereal with fruit or baked beans with cooked veggies, however the two options I’ve outlined are the most common ones I go for across a week. Also, everything I’ve listed is homemade unless otherwise specified. So without further ado, here is “What I Eat In A Day”. Hi Rebecca! Do you think you could do a day in the life of a dietitian? That would be great! Hi Rebecca. This is fun to read! Do you drink your coffee black? Would you generally have just one coffee each day?